I’ve been to a few potlucks recently and I was running out of ideas for simple, delicious dishes to bring. 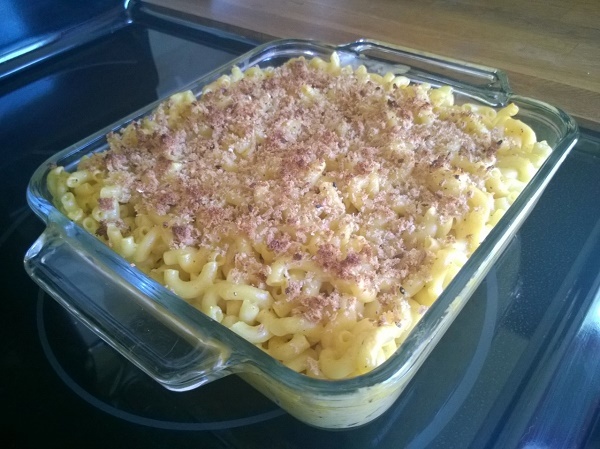 So I thought about veganizing a traditional baked mac ‘n’ cheese casserole. I started off following the directions on the package of pasta and strayed wildly–with great success! First, I brought a large pot of water to a boil (4-6 quarts). Then I added an entire box of elbow noodles and cooked them to al dente (firm). 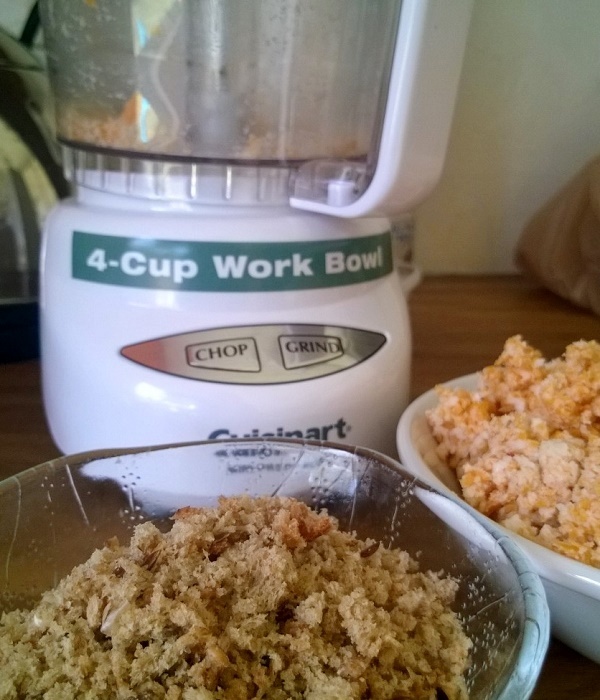 While the pasta was cooking, I turned half a slice of bread (I used Dave’s Killer Bread) into bread crumbs in my food processor and set it aside for the topping. Then I crumbled 2 cups of vegan cheeses in the food processor and set it aside too. * I combined five types of cheese to create the two cups needed for this recipe: Field Roast Chao Cheese Slices in Coconut Herb; Field Roast Chao Cheese Slices in Tomato Cayenne; Daiya Jalapeno Havarti; Daiya Cheddar Style Shreds; and Sundried Tomato from Miyoko’s Kitchen. Use whatever brands and flavors of vegan cheese you prefer. In a small pot, I melted 2 tbsp. of Earth Balance margarine and added 2 tbsp. of flour and 2 cups of vegetable broth (I used a bouillon cube to create the broth). I added chili powder, turmeric, and black pepper, set the element to low, and whisked the mixture until it thickened. The blend of spices and spicy cheeses gave this dish a nice kick. If you don’t like a lot of spice, you can use plain cheeses and less pepper. When the pasta was ready, I drained it into a colander and poured the broth mixture into the big pot where the pasta was. I added the cheeses and stirred until it was mostly melted. Then I added the pasta back into the post and mixed it up well. Finally, I scooped the whole thing into a 9′ x 9′ glass casserole dish, sprinkled the bread crumbs over the top, and baked it uncovered on 450 F for 10 minutes. I let it cool a bit, covered it up, and took it to Christmas dinner with friends. Everyone loved it–even the non-vegans. One omni even said she would have been fooled if I hadn’t told her it was vegan. A compliment for sure! This entry was posted in vegan cooking, vegan food, veganism and tagged Chao cheese, Daiya, Field Roast Chao, mac and cheese, vegan, vegan cheese, vegan cooking, vegan food, vegan recipes, veganism. Bookmark the permalink. Just made this mac-and-cheese recipe and it’s delicious! The only thing I did differently was used 3 cups of cheese and added 1lb of broccoli. Very clever to use veggie broth as part of the cheese base. Gives it a nice savory flavor, which compliments the smoky tang of the rather sharp Miyoko’s cheese we used. A perfect warm bowl of comfort food goodness on this freezing cold rainy Seattle day. I’m glad you could use the recipe! Today is a perfect day for it too. Broil sounds like a good addition. And with three cups of cheese? Yum! You can’t go wrong. Thanks for letting me know how it turned out.